Slate and tile roofs are popular in the UK because of their durability, weather resistance and long lasting qualities. With both products you can also choose from a number of colours and styles to not only set your home apart, but add something unique. 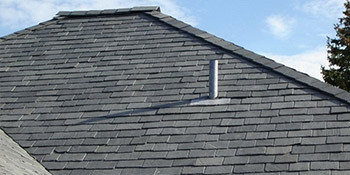 Slate rooftops in particular have a range of colours that can be used, such as black, grey, red, purple and green. This allows homeowners to utilise a colour that matches perfectly with the existing infrastructure. Because of the compound’s structure it can’t be bent and pieces are often nailed to the roof. Corners and odd angles will then be covered with copper flashing to protect the rooftop further. There are a range of benefits associated with slate and tile roofs, mainly the durability, variety of patterns, life expectancy and ease of maintenance. Both products also have a great resistance to fire and aren’t affected by rust or insects. With little maintenance needed over the life expectancy of up to 75 years, you’ll have a superb looking rooftop for minimal hassle. Select from a wide range of colours and styles and choose something that’ll look great against your home and make your property stand out. With tile and slate rooftops you’ll have a durable and resistant material that will last years and set your home apart from the crowd. With our service, we’ll provide you with up to four FREE quotes from local, vetted and reputable professionals. Project: Quotes for scissor trust for a bungalow extension. Going out 3 meters, 6 meters wide. It's for a vaulted ceiling. Plans can be e-mailed on request. Project: ground floor extension has a loose tile and sides of roof have been cemented but the cement is cracking and broken and hanging over the conservatory! Patrick and William did a good job, with minimum of fuss, and I would recommend them to do the same for you. Quotatis sent me names of roofing companies in my area. Alan from Central Roofing promptly contacted me, came, explained the job in detail, very reasonable quote. Alan has excellent mannerism, very polite, and so are his crew. Job got done very quickly, done to a very high standard! I am very pleased, very happy with what has been done! Yes I definitely recommend Quotatis and YES definitely recommend Central Roofing! Thank You Alan and his crew!! So easy and kept up to date, no hassle or sales pitch does what it says, gets the right tradesmen for the job required. Putting me in touch with two very competent companies very quickly. Properties are given an energy score dependent on how efficient they are and ratings are shown in the information beneath. This ranges from A, by far the most energy efficient, to G, the least efficient. With a higher rating you're more likely to have more affordable energy bills as more heat will probably be retained in your home. You are able to boost your home's efficiency with insulation including upvc double glazing, loft lagging or wall cavity insulation. The information beneath reveals the diverse types of houses in Uk. Essentially the most common houses all around the UK are detached and semi-detached properties. Other kinds of properties consist of terraced houses, flats, converted flats and bungalows. The data below gives an indication for the number of homes in Uk that are central heated and non-central heated. Homes are heated by a variety of sources which reflect how expensive yearly energy bills will likely be. Examples of central heating include gas, electricity, oil, solid fuel and LPG boilers. Changing the way your home is heated can see you with cheaper bills. The information below displays the spread of households warmed by different fuels. Throughout the United Kingdom the most common hands down are gas heated homes, followed by electricity and then oil. Biomass boilers are also growing in popularity, heated by eco-friendly products such as wooden pellets or agricultural waste.|Properties in Britain are warmed by a number of fuels, including gas, electricity, oil, solid fuel and LPG boilers. Each fuel has a varying cost associated with it and that means you may find yourself with cheaper energy bills by changing how your home is heated. Even solar thermal panels are being regarded as by many people in order to cut heating bills for the years to come.